Italian officials discovered a large drug package that was disguised in a rather original way. Traffickers use various methods to conceal their cargo en route to European ports and Italian police officers encountered a new one when they found 49 kilograms of cocaine hidden in containers with frozen squid. The shipment originated from Mar del Plata in Argentina and was intercepted in the town of Gioia Taura in the Reggio Calabria region. This region is the home base of the infamous criminal organization Ndrangheta, which the Italian authorities believe was the intended recipient of the cocaine with the intention to sell it for huge profit in Europe. 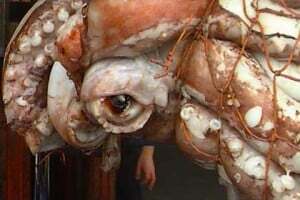 The drugs were placed in boxes with frozen squid and could have possibly been installed when the ship stopped briefly in Brazil before crossing the Atlantic, since the scanner check in the port of origin didn’t reveal their presence. Italian port controls have recently been intensified, which lead officers to intercept this sizeable package after noticing that the original seal has been replaced. The value of seized cocaine is estimated at around EUR 10 million, and the product was described as being of very high purity. Nobody was arrested in connection with the case, at least initially. South American cocaine reaches the western markets through Mediterranean ports, with Spain and Italy as the most obvious targets. Much of the trade is controlled by organized crime, and Calabrian Mafia-style group Ndrangheta is among the most prominent players in this business. The organization has confirmed contacts with criminals in Argentina and Brazil, and could be moving huge quantities of cocaine on ships bound for various European destinations. This seizure is a clear indication that a well-organized network with international connections is at work, and that methods for cross-border smuggling are getting more sophisticated and difficult to detect.